Pursuant to Presidential Proclamation No. 647, "Declaring the Month of October of Every Year as the National Statistics Month,” the NSM is annually observed nationwide. The NSM aims to: (a) promote, enhance, and instill awareness and appreciation of the importance and value of statistics to the different sectors of the society; and (b) elicit the cooperation and support of the general public in upgrading the quality and standards of statistics in the country. The Philippine Statistics Authority (PSA) issues Memorandum Circular No. 2018-01 enjoining all agencies of the government, local government units, academic institutions, state universities and colleges, and the private sector at the national and subnational levels to actively participate in and support the 29th National Statistics Month (NSM) celebration in October 2018. The Memorandum Circular, signed by Socioeconomic Planning Secretary Ernesto M. Pernia, Chairperson of the PSA Board, calls for submission of detailed list of agency-proposed NSM activities to be conducted in October 2018. Likewise, participating organizations, universities/colleges and units of the government are requested to display the 29th NSM streamers/tarpaulin in the building façade throughout the month of October. 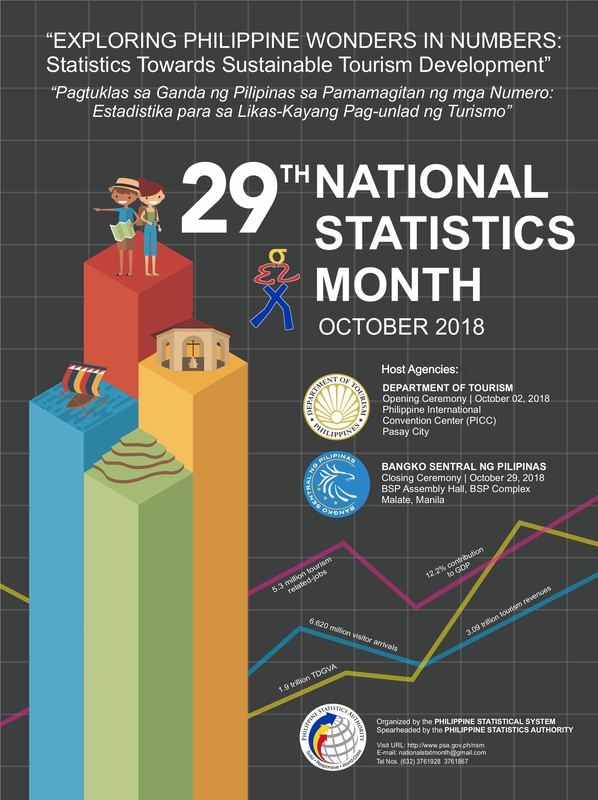 In October 2018, the 29th NSM will carry the theme “Exploring Philippine Wonders in Numbers: Statistics Towards Sustainable Tourism Development.” This reflects the relevance of statistics in achieving a sustainable and progressive tourism growth for our country and emphasizes the need for statistics to identify potential tourism havens and also areas which require intervention. With this, the PSS is encouraging the general public to participate in the celebration of the 29th NSM nationwide. For further information, please contact the 29th NSM Secretariat thru Ms. Lotis I. Ira and Ms. Willi Krizzia May G. Oracion, with telephone number (02) 376-1928 and email addresses ppd@psa.gov.ph and w.oracion@psa.gov.ph, respectively. For more details and announcements, kindly visit the NSM webpage at http://psa.gov.ph/nsm/announcements/29th, NSM Facebook page at https://www.facebook.com/National-Statistics-Month-271884873393892/, and NSM Twitter page at https://twitter.com/MonthNational.